There’s something about a fresh pair of crisp, low-profile sneakers that can really pull your look together. 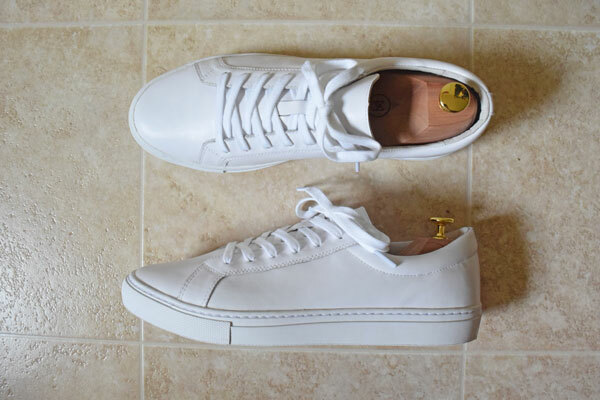 Minimalist white sneakers have become nothing short of an integral bit of a modern man’s closet, and the fact that every fashion retailer is jumping ship from flashy, in-your-face footwear to the former is case in point. Skip the branding. Let the quality and form of the sneaker speak for itself. Kent Wang sent me a sample of the new 2017 version of his Handgrade sneaker in exchange for my honest thoughts on the shoe. I am not financially compensated for this review, and the last thing I’d want to do is endorse a product I do not believe to be high quality. Let’s begin! This review is in reference to the new 2017 “pure white” sneaker and not the previous off-white version, which has been renamed to “ivory” and discontinued. This new model is made from higher quality full grain leather. I had a chance to check out the older version, so I’ll be able to compare the differences in the two. 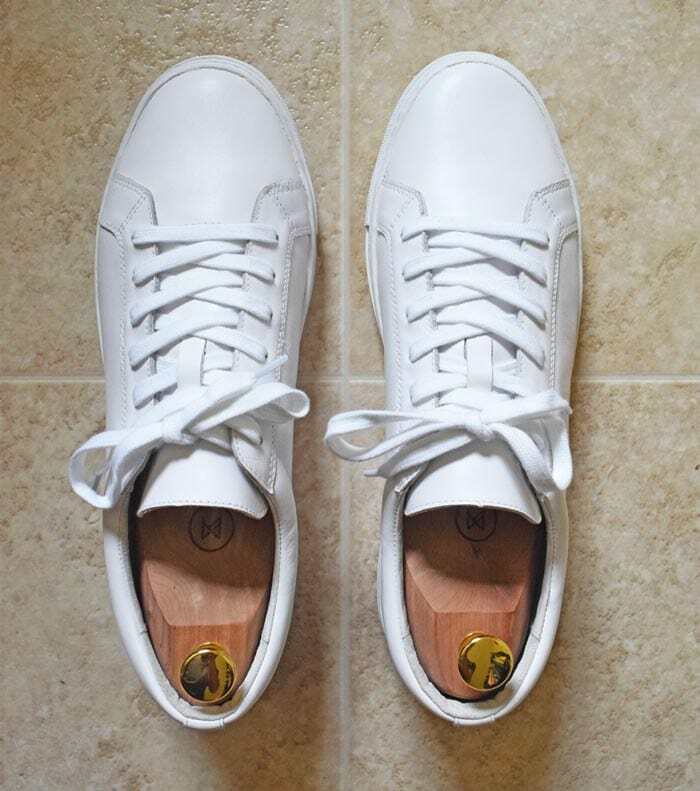 Kent’s sneakers used to come in two tiers: the handgrade ($145), which features stitched soles and “superior quality” (difficult to really quantify) leather as well as the benchgrade ($95) which has lower quality leather and glued soles. The benchgrades are no longer being restocked and the handgrade will be the main offering. 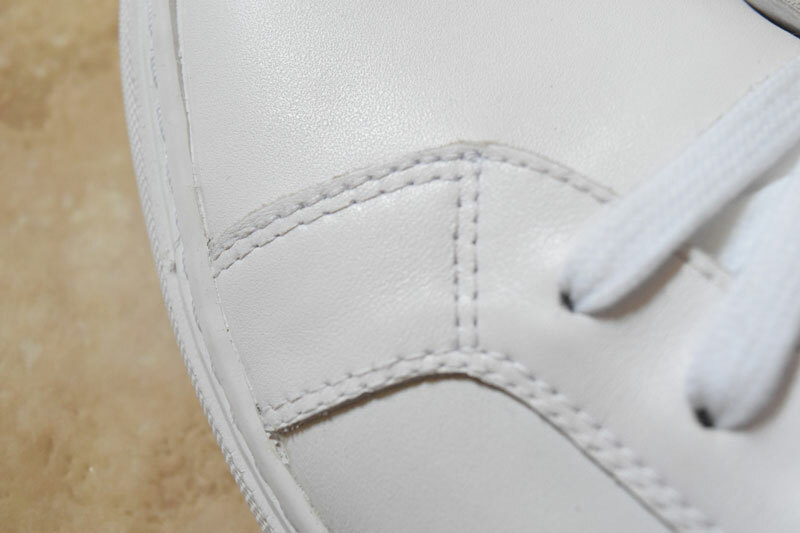 The full-grain leather that composes the sneaker is sourced from Italy, where the tannery sorts the less wrinkled and blemished hides for use in the Kent Wang Handgrade sneakers. The sneakers themselves are produced in Vietnam. Out of the box, the shoes were exactly as pictured on the website. No scuffs, stitching errors, or outright irregularities upon closer inspection. Unlike last year’s off-white version, these were totally bright white. 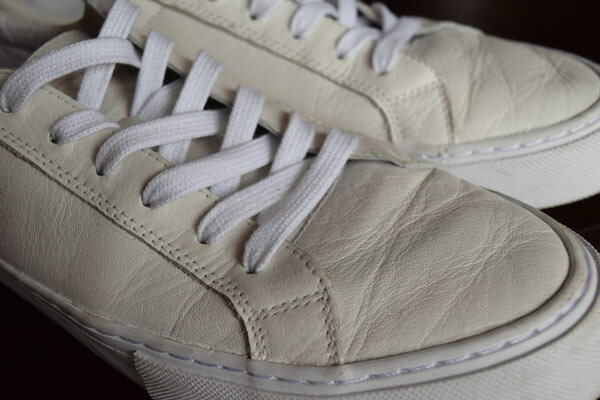 The laces were maybe a single shade whiter than the leather, but that’s just the nature of dyed cotton versus animal hides. The Kent Wang Handgrade sneakers only come in whole sizes, and it’s recommended to size up if you’re in between. I wear a 10 or 10.5 in most shoes and went for a 10 for the Kent Wang Handgrades. The fit is pretty true-to-size in my opinion – perfectly snug without squeezing the lil’ piggies. Something I noticed is that the laces are just a bit too flimsy, resulting in them bouncing around a little with each step. Not a huge deal, but I would have loved for them to come standard with some waxed flat laces. 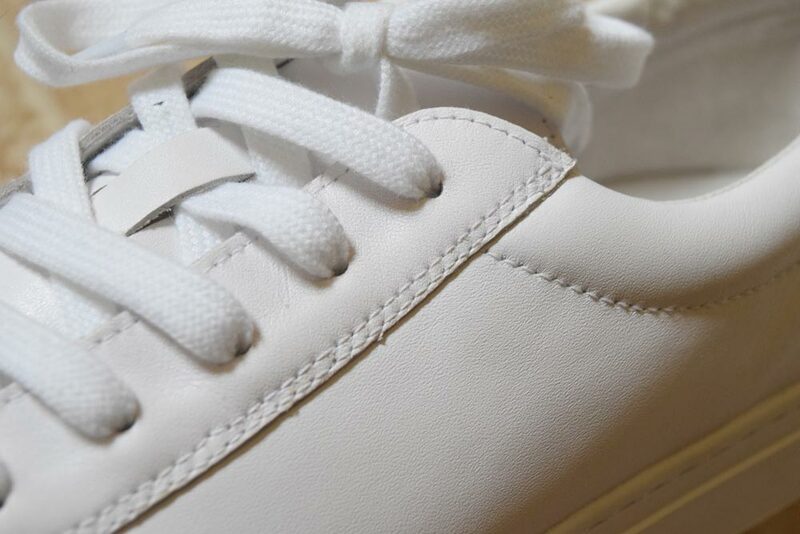 The form of the Handgrades is incredibly simplistic, sharing design choices with Common Projects Achilles without being a carbon copy. The leather is smooth and buttery – soft, but not too impressionable. Last year’s model was made from leather that was incredibly prone to wrinkles and creases, and it detracted from the value proposition of the sneaker a lot. I’m very pleased that the former leather has since been replaced with significantly higher quality full-grain leather, which bends and morphs with each step without leaving any unsightly creases. The fact that the leather on the 2017 Kent Wang Handgrades is much more resilient to bending and wear is a huge plus in my eyes. We all know of the dreaded break-in period (bats flutter out from the corner of your room) for a new pair of leather shoes, but I was actually pleasantly surprised with how well these felt right out of the box. 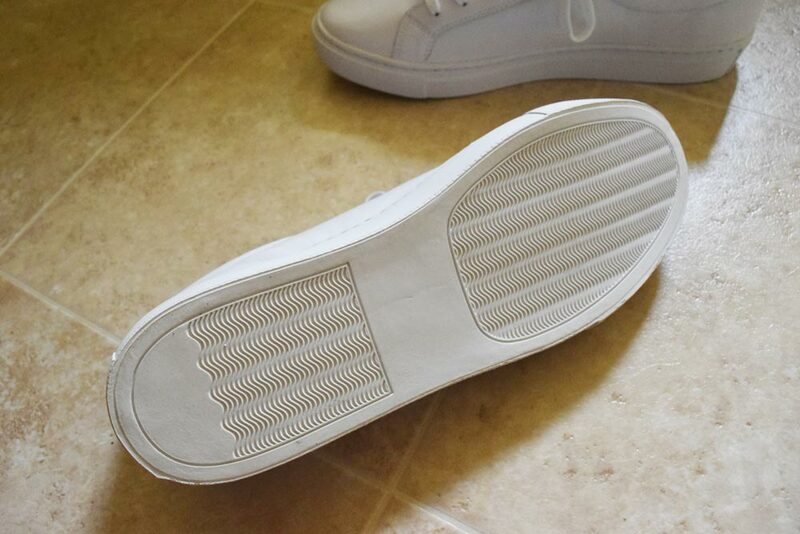 The inner lining of the sneaker isn’t something to write home about as it’s practically non-existent. I made the mistake of first wearing these sockless and my heels were irritated within minutes, so I would absolutely recommend no-show socks when wearing these out. Would have been really nice to have a softer lining inside the Handgrades, but it’s really nothing to lose sleep over. I’ve had the Kent Wang Handgrade sneakers for about a 5 weeks now, and I’ve worn them most of those days. I’m not necessarily running marathons in them, but I’ve walked quite a bit in them and I’m satisfied with how they feel after a few hours of walking around town. Scuffs and small blemishes rub off pretty easily for the most part. I did pick up some white shoe cream and a Jason Markk cleaning kit, which I’ve heard great things about but have yet to actually try out. The bottom looks like a pretty standard Margom rubber sole and there isn’t much to say about it. It’s flexible and is easy to clean. The pattern kind of looks like someone left a coffee cup on the tilde (~) key. 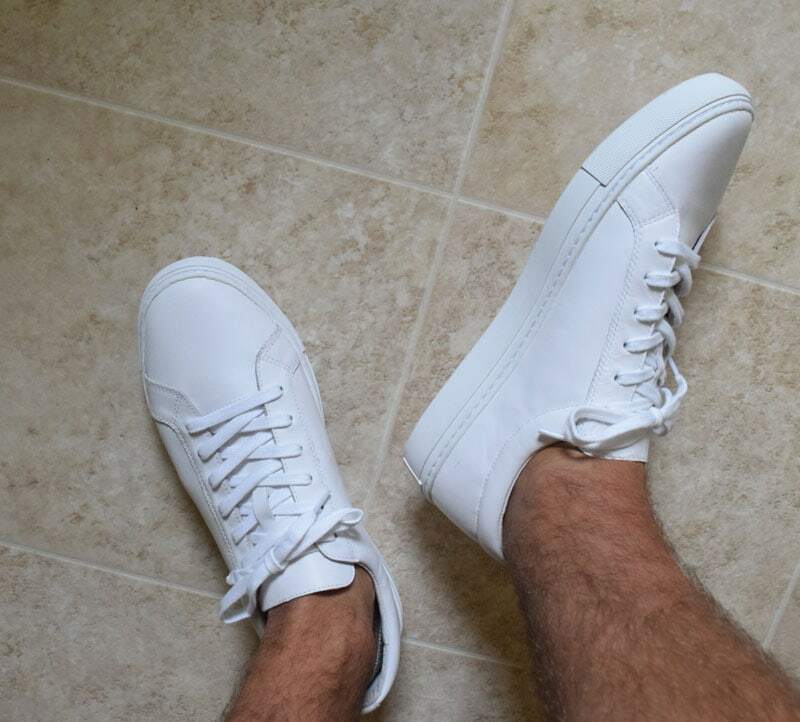 For $145 ($140 if you choose to omit the shoebox), the Kent Wang Handgrade sneaker is a solid bang for the buck, especially if you want the slimmer profile similar to Common Projects, but unlike Greats or Stan Smiths. 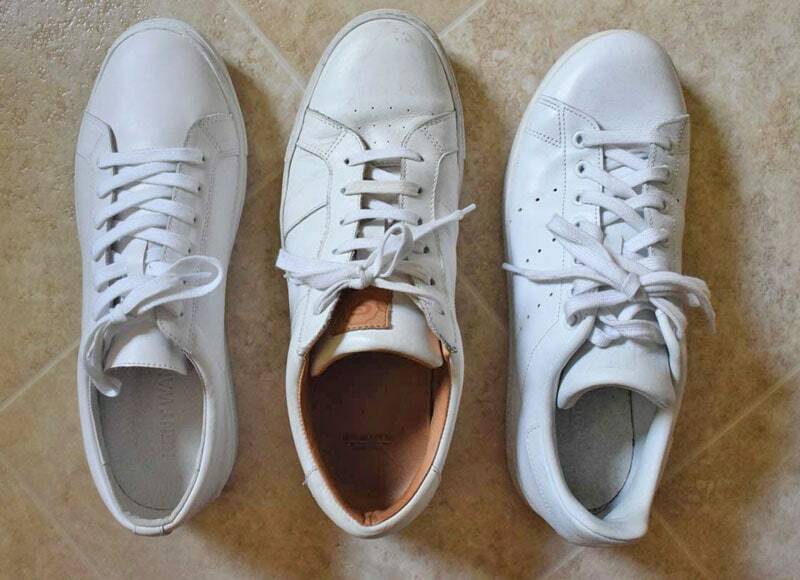 Not the best photo, but here you can see the different profiles of three popular minimalist sneakers: the Kent Wang Handgrade ($145), the Greats Royale blanco ($179), and the Adidas Stan Smith triple white (~$70). Disclaimer: I love all three of these shoes. The Greats are certainly a bit bulkier, but that’s probably credited to the Vachetta inner lining. The Stans are also thicc-er than the Kent Wangs, and the Adidas leather creases like printer paper. The Handgrades are noticeably slimmer than the other two sneakers, which is a huge plus for those who like slim profile outfits. I do wish they had some lining similar to the Greats though. All in all, I’ve been loving the Kent Wang Handgrade sneakers. I think the price is definitely reasonable, especially when compared to some more expensive options like Common Projects and Buttero. I’d love for them to come with waxed cotton laces in lieu of the flimsy set they’re shipped with, though it’s not a point I’d detract points from – just something worth noting. I also wish they would’ve had some more padding and lining as it can get uncomfortable walking around sockless or with no-show socks that don’t cover the heel. The 2017 iteration of the Handgrades is a huge leap in quality when compared to the older version: much better full-grain leather, a purer white color, and a reasonable price to top it off. Pro-tip: Current students can get 15% off their purchase at Kent’s site through Unidays, bringing the price down to just above $120! 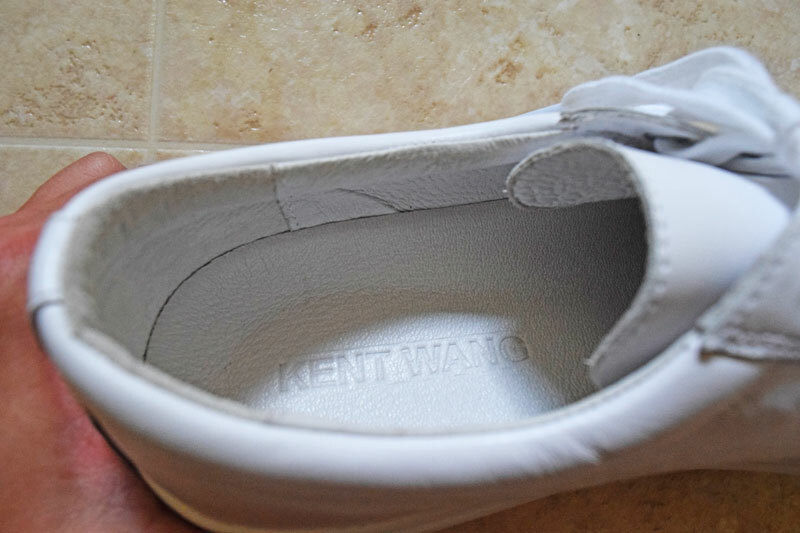 Check out the Kent Wang Handgrade sneakers here. I’ll do my best to keep this review updated as I wear the shoes longer. If you have any specific questions or comments, shoot me an email at business@stylesofman.com or an Instagram DM @stylesofman.